Too many businesses sell for far less than they should! 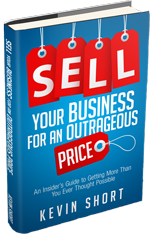 Featuring real-life case studies and an appendix of indispensable tools including due diligence lists, a sale readiness assessment, sample nondisclosure agreements and a sample engagement letter, this insightful guide reveals how owners can get outrageous prices for their companies. Kevin Short (St. Louis, MO) is the Managing Partner and CEO of Clayton Capital Partners, a leading middle market M&A advisory firm. Over the past 25 years, he has orchestrated over 150 purchase/sale transactions of mid-sized businesses with an aggregate value of more than $1 billion.